CD Genomics is now offering Hi-SNPseq, which is an innovative and scalable method for high-throughput SNP genotyping by combining multiplex PCR and next generation sequencing technology, enabling quantitative multiplex data analysis and accurate SNP calling. Hi-SNPseq combines multiplex PCR and high-throughput sequencing to perform multiplex PCR amplification with site-specific primers in a single tube. Different samples were distinguished by different barcoded primers. After mixing the samples, high-throughput sequencing was performed. Bioinformatics methods are used to distinguish different samples, and finally obtaine the SNP information of each site. 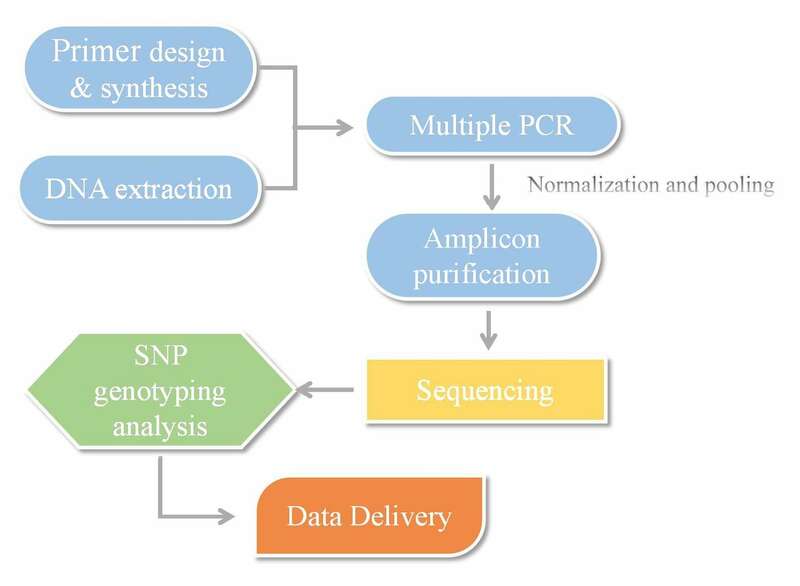 Compared with other SNP detection technologies, SNP genotyping based on high-throughput sequencing is more accurate and sensitive. Hi-SNPseq is very suitable for SNP analysis of large number of SNPs and large-scale samples, it is widely used in the study of population genetics and genes related to diseases. High Throughput: Up to thousands of SNPs can be genotyped in one reaction, and thousands of samples can be genotyped together using multiplex sequencing with Illumina sequencer. High Specificity: The primers require specific bindings of both 3’ arm and 5’ arm, resulting in a significant increase of specificity as compared to regular primers. Cost Effective: Assay costs significantly less than most of other high throughput SNP genotyping platforms. Simplified Hand-on Workflow: Just one amplification and one purification are needed before sample uploading on the NGS sequencer. High Success Rate: SNP call rate routinely above 97%; Sample pass rate consistently above 98%. The procedures for our Hi-SNPseq is illustrated below. With state-of-the-art sequencing platforms and deep collaboration with highly experienced technicians and scientists across departments in CD Genomics, we make this Hi-SNPseq technique affordable and reliable to process large-scale genotyping. If you have additional requirements or questions, please feel free to contact us.